The plan to 3D-print a bridge in mid-air was always bonkers. How could a technology best known for creating flimsy prototypes and personalized action figures be used for permanent construction projects? Well, the team at MX3D in Amsterdam just answered all of the hard questions and revealed it: the world’s first 3D-printed bridge. It’s made of a completely new type of steel, spans 40 feet, and will be installed early next year in De Wallen, the largest and best-known red-light district in Amsterdam. It also looks utterly otherworldly. The newly printed bridge just arrived back in MX3D’s workshop in north Amsterdam from a larger facility outside the city. There, the team of designers and engineers that has been working on the project for years will test the bridge’s integrity and add some finishing touches, including a clear coat to protect the ruddy steel exterior from the elements and a steel deck—which is basically just a huge plate of traditional steel—that will serve as a walkway. The final phase will include the installation of a series of smart sensors that will monitor the bridge’s health and take a slew of measurements in real-time, including air quality and weight dispersion so the bridge will actually know how many people are walking on it and how quickly they’re moving. The sensor data will also be fed to a “digital twin” bridge model that will help engineers understand how the bridge is performing over time and make tweaks to future designs accordingly. Safety is a key part of all of these tests and the sensor network that will follow. Given the fact that a 3D-printed bridge like this has never existed, MX3D worked with the city to establish a unique, new safety standard as well as a testing plan to ensure the bridge’s lasting integrity. The sensor network will also enable engineers to monitor and address safety issues with such accuracy that the 3D-printed might well be the safest bridge in the city. But obviously, the bridge’s 3D-printed construction will turn heads. It has since 2015, when MX3D shocked the world by announcing plans to 3D-print the bridge in mid-air over one of Amsterdam’s canals. That concept explored the possibility of using a new custom-designed type 3D-printing robots that could create weight-bearing structures below them and then slide forward as the hot building material set. These so-called MX3D bots could build things of any size by moving around the object in open air rather than inside of a machine. Theoretically, such technology would let them print massive structures safely on location. The genesis of the 3D-printed bridge was unconventional to say the least. In 2004, Joris Laarman founded a design lab in Amsterdam and began experimenting with various materials and applications for various technologies. Much of Laarman’s work looked to natural designs for inspiration, but a growing interest in technology led to the development of a six-axis robot that could do large-scale, free-form 3D printing and the founding of MX3D. Whereas traditional 3D-printing takes place inside of a machine, this new type of technology could print in mid-air without conventional limitations. Laarman and his co-founders first used the new MX3D printers for several experiments before creating a sculpture called The Dragon Bench. This art piece used a combination of metals to create a self-supporting structure that looks a big rusty wave. Dragon Bench sculptures are now in museum collections around the world, but the piece also served as a proof of concept for the much larger, more practical, and more ambitious bridge project. MX3D didn’t quite make it to the proverbial moon on this first attempt. In 2015, Laarman and the team partnered various companies and organizations, namely the American software company Autodesk, and demonstrated their machines’ capacity to create a weight-bearing structure on a small scale. They also announced plans to print the full-sized bridge in open air over an Amsterdam canal. The City of Amsterdam hired MX3D to provide a bridge that would replace an existing structure on its canals. According to van der Velden, the project’s budget was comparable to what the city would have paid for a traditional bridge with additional funding to come from several sponsors. However, the plan to print the bridge in mid-air later changed. After more deliberation and testing, the team decided to move the 3D-printing process into a large studio space where they had control over the environment and where pedestrians couldn’t interfere. The bridge designers also changed the blueprints pretty significantly. Instead of pursuing a form that looked more like a bone structure, they settled on something that looks like two billowing sheets of fabric connected by organic curves of 3D-printed steel. The whole thing looks somehow informed by H.R. Giger and would be right at home in an Alien movie. What’s especially unique about this design is how MX3D decided to leave the surface rather rough. The 3D-printing process involves a robot applying layer-after-layer of steel onto the bridge. This creates a ribbed surface that can be buffed out which makes it look more like traditional steel, but the finished bridge will keep this raw appearance. It actually makes the bridge almost appear to be alive. The strangeness of the bridge offers a clue into the remarkable possibilities of the technology that helped to create it. While MX3D does have plans to build more bridges—it has several projects already in the pipeline, though none of the plans are concrete—the company also wants to leverage this new process of 3D-printing steel for commercial purposes. In the maritime, aviation, and commercial construction industries, there’s often a need to create a single unique piece that requires a cast to be constructed and used only once. The nature of 3D-printing means that pieces like this can be built and customized on the fly at a much lower cost. They can be designed to weigh less, as well, thanks to 3D-modeling software. One can only imagine what would be possible if MX3D does manage to let loose its team of mobile 3D-printing robots completely. In the engineers’ minds, these robots could scale buildings, creating custom facades on the construction site and organic shapes that wouldn’t be possible using conventional methods. Lighter components would also make for all kinds of new forms in buildings, designs that we haven’t even thought of yet. But first, the bridge. Commissioned by the city of Amsterdam, the new 3D-printed bridge will be span the Oudezijds Achterburgwal canal where it crosses Stoofsteeg, an alleyway in the red-light district. There’s currently a temporary bridge in place, and it’s not hard to see how the MX3D-built structure will be a huge improvement. All things told, it took MX3D a year to get the bridge into its current condition. 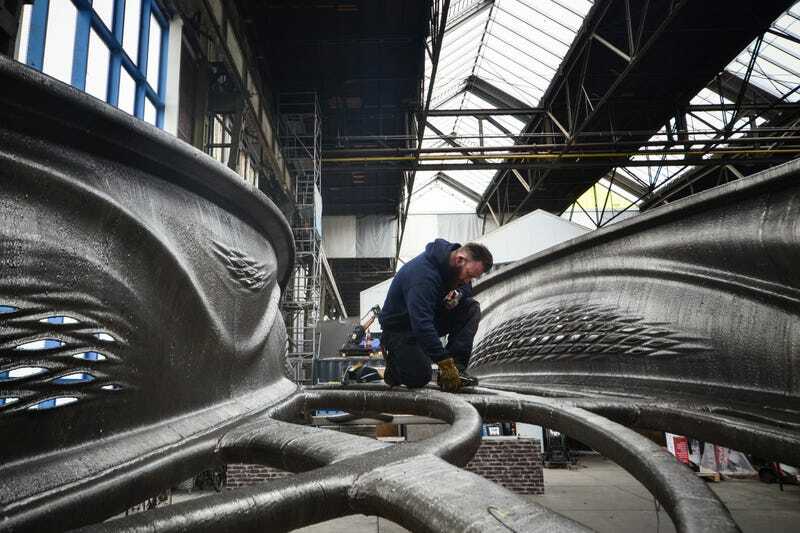 The company’s engineers will be completing a couple final spirals for either end of the bridge in the north Amsterdam studio over the next six months, as it conducts a series of tests in partnership with Arup and Imperial College London. In the meantime, the city of Amsterdam will be renovating the walls of the 15th-century canals around the Oudezijds Achterburgwal canal. The bridge’s final installation will take place once those improvements are completed. And as far as MX3D is concerned, this is only the beginning. Amsterdam is the place to watch for these big changes, too. There’s already a partially 3D-printed bridge near Amsterdam in the village of Gemert, though the concrete block design is rudimentary compared to the MX3D bridge. Meanwhile, not far from MX3D’s studio, a consortium of architects are working on 3D-printing an entire canal house. As is the case with many large-scale 3D-printing projects, it’s unclear how far along they are. So many of these ambitious and futuristic 3D-printing projects fail to make it further than the headline-grabbing concept stage. We’ve seen the world’s largest free-form 3D printer create beams for home construction in Tennessee. We’ve seen a Chinese company 3D print ten houses in a single day. There are countless large-scale 3D-printing experiments out in the world but still so few real things that real people use. But so far, it looks like MX3D is the exception. 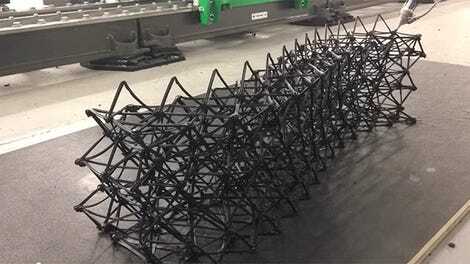 These designers and engineers actually 3D-printed a bridge. They stood on it, walked across it, took pictures with it. The 3D-printed bridge is a real thing.